The American Flag is an important symbol of the United States of America, and should be treated as such. The rules and suggestions that follow are meant to encourage flag display in an appropriate manner, and are in conformance with rules and customs established by Congress in 1942. When carried in a procession, the flag is always positioned on the right side of those marching. For a speaker on stage, either standing or sitting, the American flag should be placed to the speaker's right, while other flags are placed to the speaker's left. When the flag is hung on a wall, the stars should be placed at the top of the flag's right - that is, the observer's left. The flag can, and should, be displayed on any day with decent weather during daylight hours. It may be flown during the night as well if it is properly illuminated, usually by a spotlight. Federal holidays are excellent opportunities for flag display, as is Flag Day. On Memorial Day, the flag is traditionally flown at half staff until noon, when it is then raised to full height. At other times, the President of the United States proclaims when the flag should be flown at half mast. When a flag's condition is poor, it should be destroyed by burning. Exuberance over "showing the flag" should never win out over taste and decorum. The flag should never be used for purposes of advertising; nor should it be used as wearing apparel, bedding, or drapery. To make a patriotic display, consider red, white and blue bunting. Flag patches should not be part of an athletic uniform, but may be worn on the uniforms of military personnel, firemen, Scouts, and members of patriotic or other national organizations. And the folds of azure blue. Is that starry flag of ours. Then raise aloft "Old Glory,"
Or in peace with honor bound. As the eagle soaring high. For that starry flag of ours. Q. How many stars and stripes are on the flag? A. 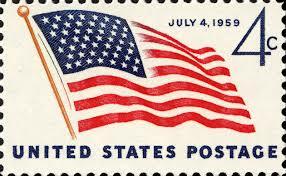 There are 50 stars representing the 50 states and there are 13 stripes representing the 13 original states. Flag: thirteen equal horizontal stripes of red (top and bottom) alternating with white; there is a blue rectangle in the upper hoist-side corner bearing 50 small white five-pointed stars arranged in nine offset horizontal rows of six stars (top and bottom) alternating with rows of five stars; the 50 stars represent the 50 states, the 13 stripes represent the 13 original colonies; known as Old Glory; the design and colors have been the basis for a number of other flags including Chile, Liberia, Malaysia, and Puerto Rico. Q. When are new stars added to the flag? A. A new star is added to the flag on the July 4th following the entry into the Union of the new state. Q. What are the specifications for the colors of the flag? A. In the Pantone system the colors are: Blue PMS 281 and Red PMS 193. Q. Who made the first flag? A. Betsy Ross, made the first flag. Presentation of the flag during a ceremony should be preceded by a brief talk emphasizing the importance of the occasion. Following the presentation all present should salute the flag, recite the pledge of allegiance, and sing the national anthem. The life of your flag depends on your care. Dirt can cut fabrics, dull colors, and cause wear. Most outdoor flags can be washed in mild detergent and thoroughly rinsed. Indoor and parade flags should be dry-cleaned. Many dry cleaners offer free cleaning of U.S. flags during the months of June and July. Damaged flags can be repaired and utilized as long as the overall dimensions are not noticeably altered. American Legion Posts and local governments often have facilities to dispose of unserviceable flags. Store your flags in a well ventilated area away from any harsh chemicals or cleaning compounds. If your flag gets wet, never store it until it is completely dry. Wet folds cause permanent creases. Dampness ruins fabric and causes mildew. Pole care is also related to flag care. Rust and scale cause permanent stains and some metallic oxides actually eat holes in fabric.